The goal in any learning initiative is to individually transfer critical learning and adaptive reasoning skills in the shortest time possible. Instructional design is key to learning transfer. The right learning/educational technology is also key to learning transfer. Learning research validates that the optimum individual outcomes happen in a personalized, one-to-one, learning environment. The best attempts at personalization, (accelerated learning methodologies), can traditionally be added into the content/delivery, or true personalization can be integrated into the learning technology, individualizing each participants learning experience. Joan T. Cook raised an interesting question at the Instructional Design and eLearning Professionals’ Group “How would you go about converting a face to face course to an eLearning format?” Several professionals in the Learning industry want to convert their f2f courses into an eLearning format. However, several of them do the same mistake again and again. They believe that by simply moving their content such as PowerPoint presentations, videos, audios, and documents to a Learning Management System that they have converted their face to face courses to an eLearning format. In my opinion, they have convert their traditional courses to an electronic format. In this post I will present you the TOP 5 tips to Convert your Traditional Course into an eLearning format. During my MBA program at BGSU I remember Dr. Garcia saying “Cash is the King”. In our case you should always remember that “Content is the KING!!!”. As a result, I assume that in your f2f course you use the most amazing content. 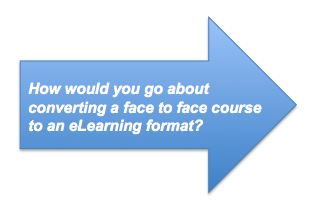 A f2f course can be converted in the following three eLearning formats. Asynchronous Learning: Learning in which interaction between instructors and students occurs intermittently with a time delay. Examples are self-paced courses taken via the Internet, Q&A mentoring, online discussion groups, and email. A primary area of investment in corporate eLearning development is asynchronous learning. As opposed to traditional instructor-led training or even distance learning that centers on teleconferencing and online presentations, asynchronous eLearning occurs in an environment where a single learner interacts directly with content via a technology system, maximizing flexibility in timing and access for the learner by allowing learner control of pace, schedule, and location. Hybrid / Blended Learning: Learning events that combine synchronous and asynchronous learning, and face-to-face instruction. The question that will be raised is “What eLearning format is best for me”? According to research and to my experience the eLearning format that has the most advantages is the Hybrid Learning format because it uses the pros of the synchronous and asynchronous learning. If you still want help to answer this question I will highly encourage you to analyze your learners’ needs. This analysis will help you to choose the right eLearning format for your course. I am sure that you are familiar with ADDIE. However, ADDIE is not a universal solution! Based in my experience Robert Gagne’s instructional design model, which is best know as the nine events of instruction, is the most appropriate Instructional Design Model for converting a traditional course into an eLearning format. However, to find the best Instructional Design Model you have to do your own research! The question that will be raised is “Why it is crucial to use an IDM”? The answer is really simple. Because with the use of an IDM you will ensure that learning is happen more safely, certainly, thoroughly, and expeditiously than might otherwise happen. At the same time, you will facilitate the learning process such that learners require less time, incur less risk, and invest less energy than those who learned from the raw world without assistance. Learner to Content: The learner to content interaction refers to the interaction between the learner and the content or subject matter. Moore believes that if a learner interacts with the content/subject matter, then changes in the learner’s understanding occur. Learner to Learner(s): The learner to learner interaction can occur outside of or in group settings with or without an instructor present. The third type of interaction occurs when learners engage in discussion moderated by the instructor. At the same time, learners’ groups may be given responsibility to act autonomously for conducting group projects, or other forms of group-lead activities. Based on the eLearning Course Format and the Instructional Design Model that you will use you will be able to choose the type(s) of interaction that you will use at your eLearning course. 4) Choose the right educational technology.